A Native American investigator returns to the reservation to find the truth behind her friend’s death — and discovers family secrets and dysfunction — in the new mystery novel Whispers in the Wind (Pace Press, March 2019) by Veronica Giolli. 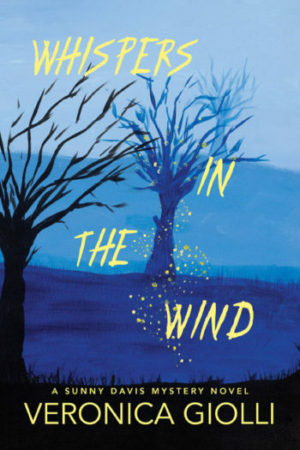 Combining fully realized Native characters, family drama, Native spirituality, the paranormal, and the everyday reality of modern Native American life, Whispers in the Wind is a fascinating detective novel that appeals to the logical and intuitive mind. Writing in a taut, spare, down-to-earth style that encompasses procedural investigation and psychic vision, Veronica Giolli has created a remarkable new detective heroine who is both smart and spiritual. When Sunny receives a psychic vision of Gina’s brutal death and senses that Gina’s spirit is contacting her, she realizes that it’s up to her to find out what really happened. Guided by her expertise as a fraud investigator, her psychic abilities and her keen, logical mind, Sunny launches her own investigation. Sunny’s inquiries take her through every level of modern Native American life, from a Reno casino to a reservation sweat lodge to the kitchen tables where Native families talk, quarrel and show their love for one another. But while Sunny is trying to find out what really caused Gina’s death, she must also deal with the emotional tumult of returning to her hometown and meeting her past at every turn in her investigation. As Sunny uncovers the secrets of Gina’s troubled marriage, she finds uncomfortable echoes of her own complex feelings toward her charming, alcoholic husband, as well as her grown daughter’s predilection for unreliable men. Caught up in an investigation that touches her so closely, Sunny wonders who she can trust — and when her car is nearly rammed off a rain-slicked highway, it’s clear she can’t trust anyone. But Gina’s restless spirit keeps coming back to her, demanding that Sunny give her peace. Sunny’s investigation leads her deep into a complex mystery, her tribal culture’s spiritual beliefs, and the secrets that tore apart Gina’s family and threaten her own. About the Author: Veronica Giolli’s mystery stories have previously appeared in The Poison Pen. She was a founding member of Writers of the Purple Sage Publishing Consortium in Reno, Nevada. While living on a reservation Giolli acquired firsthand knowledge of tribal customs and spiritual practices. This in part provided the inspiration to write her first novel, Whispers in the Wind. Giolli lives in California’s Central Valley. 6″ x 9″ trade paperback, 226 pages. Also available in e-book formats.